You use Laravel valet (You can use any development environment though). You have MySQL installed on your machine. You have a global installation of Composer. You have Ngrok set up (You won’t use this if you are using Valet). You have a Twilio account. You have a verified number (If you are in trial mode). This command creates the .env using the .env.example as a template. Open the .env file and add the database credentials for database name, username and password. Create a database and set the credentials of that database in the just created .env file. If you completed all of these steps correctly, you should see your new app in the browser by running valet link from your terminal. In my case, I named the folder "twilio" and specified a .devs extension, so my URL is twilio.devs. After setting up the database credentials, we can now set up authentication using the artisan command. Laravel provides quick scaffolding of all the routes and views we need for authentication using this simple command. With this one command, we can install a layout view, registration and login views, as well as routes for all authentication endpoints! After running this command, run the migration. And when you check your database, you should see the tables created by the make:auth artisan command. If you refresh the app, you will also notice some authentication links automatically added to the interface now. The next thing we are going to do is to add our Twilio credentials to the .env file. Visit your Twilio dashboard and copy your Account SID and Auth Token. This is the point where we start doing the actual work of making sure our app calls the user upon registration, and to make sure the user can also login with his phone number. We would not want our users to be unable to log in after registration. The above code changes the email field to phone. It also adds a verification_code field to the user table that stores the code that will be told to the users when they are called. a phone_verified_at field is also added to the user's table to store when the user's phone number is verified. The hasVerifiedPhone method just checks to see if the phone number of the user is verified. The markPhoneAsVerified verifies the phone number of the user by setting the phone_verified_at field of the user to the current timestamp. This method returns the login username to be used by the controller. It is basically saying "This is the field in the database you should look up as the username when authenticating a user". The above methods just make sure we validate and store the user input properly during registration. Nothing fancy here. We have successfully tweaked our app to accept phone numbers during authentication. Well done! At this point, we need to protect our routes from users with unverified accounts. We do so by creating a middleware that we apply to the routes we need to protect. We also need to create the necessary controller and routes for verification. Let's get to it. Now we need to register the middleware so that the application knows about it. Open the app/Http/Kernel.php and add this to the $routeMiddleware array. Now any user that visits the home route without verifying their phone number will be redirected to the route we specified in the middleware. In the show method, we are saying "If the user has a verified phone, simply redirect the user to the home route" else, return a view notifying them to provide a verification code. In the verify method, we are verifying a user. Notice how we use the hasVerifiedPhone method we created earlier in app/User.php. Let’s now create a view where users can provide their verification code. This is where we actually call the user and disclose the verification code. We first generate a random 6 digit code and store it to the user. After that, we create a client to help us talk to Twilio's API using the credentials we stored in .env earlier. The phone number to be called. For us, this will be the user's phone number. If you are in trial mode, this has to be a verified phone number. The second parameter is the phone number making the call. This has to be a voice-enabled Twilio phone number created in your console. If you don't currently own a Twilio phone number with Voice functionality, you'll need to purchase or create one for testing. The 3rd parameter is the most interesting part of Twilio's programmable voice API to me. The 3rd parameter is a URL to an XML file that must return a valid TwiML (Twilio Markup Language) or a URL to your application that Twilio makes an HTTP request to, asking for instructions on how to handle the call. This has to be a live URL because Twilio is going to send an HTTP request back to it. This is where Ngrok comes to play. It will help us get a live URL to our application. Run valet share and copy the ngrok URL. In the app/User.php at the callToVerify() method, replace "your-ngrok-url" with the URL you copied above. Visit your website and register with a phone number. Input the code you heard during the call in the view you are directed to after registration. NOTE: When registering, Phone numbers should be formatted with a '+' and country code e.g., +16175551212 (E.164 format). 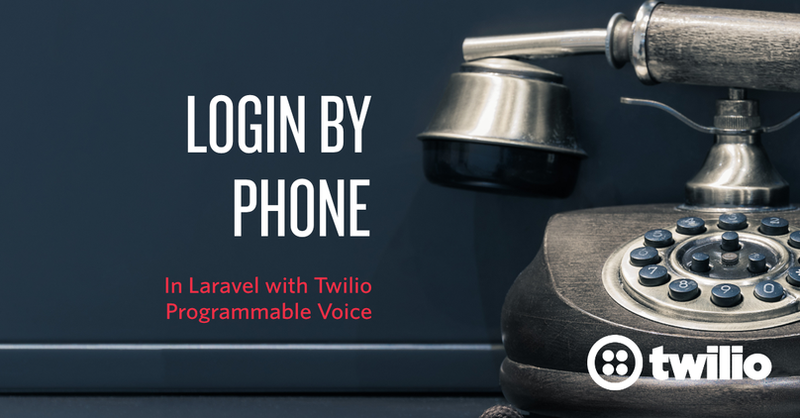 Believe it or not, This is all it takes to achieve phone verification using Twilio's Programmable voice, Twilio TwiML™ and Laravel. Awesome!